Helping children develop independence is a foundational part of the Montessori community. From the moment children are born, they begin working on strengthening their independence. Helping to provide opportunities for children to explore their capabilities is the work of both parents and teachers and is supported by the structure of the Montessori classroom. Dr. Montessori speaks about overhearing a young child asking an adult to “help me do it myself” rather than the adult doing it for them. This concept is the idea behind a child’s quest for independence. 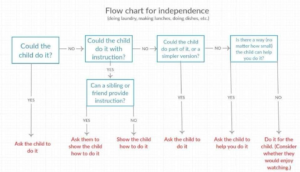 I recently saw this flow chart for independence, and I think it provides a straightforward, simple process for adults to follow when trying to determine appropriate independence. Powerful in its simplicity, this flowchart helps us see how independence means different things for children at different ages and stages of development. Looking for ways to support children in the process of being independent is one of the most important works of Montessori teachers and parents. While this work is challenging for us as adults, the wonderful reward is that we are able to help children develop into strong, capable adults. Helping children become independent is our work in that we have to know consciously what not to do as well as what to do in order to help them build independence. The importance of this work is reinforced by the fact that we know independence is best built, over time, with support, giving children the chance to fail, try again, and ultimately succeed. This process develops a growth mindset and also gives us the opportunity to convey to our children that we believe they are capable of success. Here is a quick video that shares another perspective of supporting children’s independence with 4 simple steps: 1) do it FOR them, 2) do it WITH them, 3) WATCH them do it, and 4) let them do it INDEPENDENTLY. To support your child’s development of independence, look for ways to allow your child to learn and expand their own capabilities and enjoy watching the strength and confidence they develop in the process.